Alton is a place that’ll ring a bell with a lot of people in the UK. 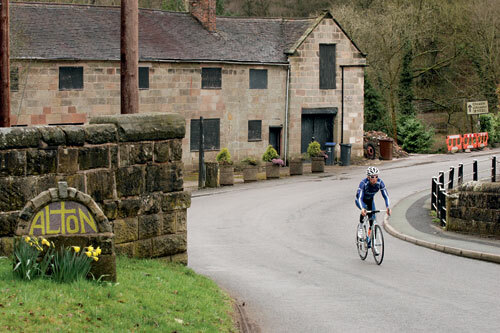 It’s a small, picturesque village located just south of the Peak District, but it’s not best known for its challenging cycling roads. It’s a village which, during peak times, is clogged with people carriers and the sound of excitable and often petrified screams. That’s because Alton is the home of the popular theme park, Alton Towers. Our ride guide is young hopeful Kieran Frend. The area is the furthest point on a regular, hilly 50-mile loop that has been used throughout the winter for training purposes. Frend’s work here appears to be paying off. Last year, at just 20, he beat a handful of established elites to win the West Midlands Divisional Road Race Championships. Now 21, his concentration on being able to get up the climbs but maintain his power on the flats means he is ideally suited to hilly races; and Frend certainly has the climbing physique. 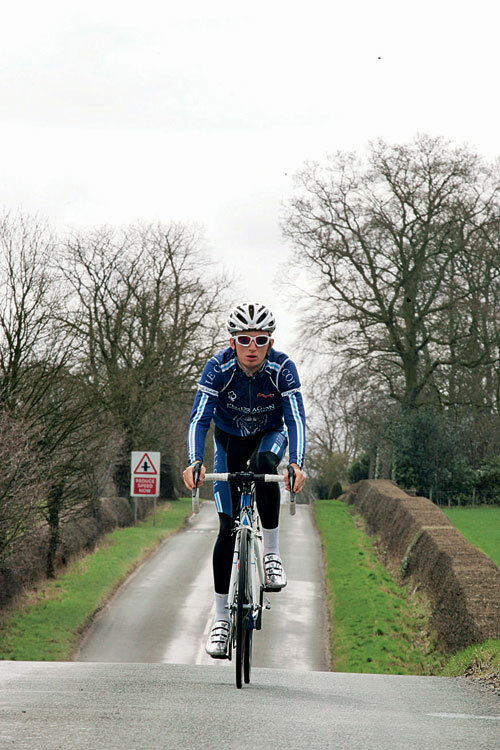 Often, cyclists that show promise at an early stage in the senior categories have been racing a bike for nearly as long as they’ve been walking. For Frend, that’s not really the case; he’s a relative newcomer. 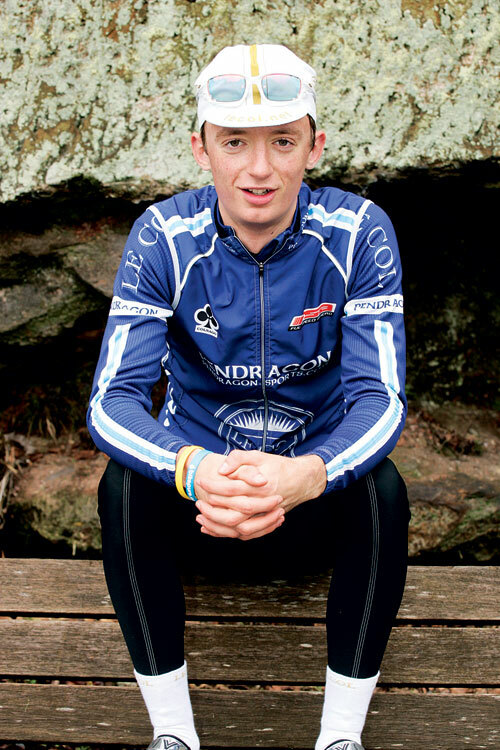 “I started mountain biking with my dad a few years back and bumped into Adrian Timmis at Cannock Chase; he recommended that I started some road racing, and it just moved on from there,” he says. Our ride starts from Frend’s home in Barton-under-Needwood. It’s a calm, small and friendly Staffordshire village. Amusingly, perhaps, Kieran Frend isn’t even the most well-known cyclist in the village. It’s also home to the catalyst to Frend’s interest in road racing, 1987 Tour de France finisher, Adrian Timmis. 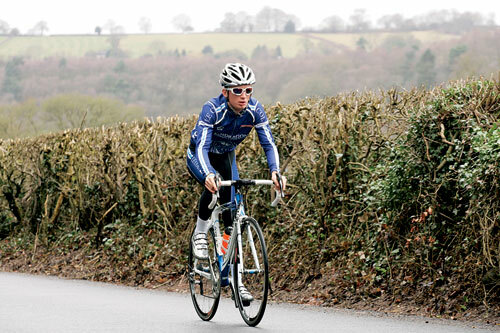 Staffordshire and the surrounding area has its fair share of resident professional riders. Team Garmin-Transitions’ Dan Martin spent a lot of his riding time close by, as well as going out on the same CC Giro training runs. Raleigh’s Dan Fleeman also lives just a stone’s throw away. He leaves the village sporting his new team-issue Colnago and co-ordinated Pendragon-Le Col- Colnago kit. It’s a new team for 2010, and Frend is the youngest team member. With established riders in the team such as Yanto Barker and David Clarke, he’s now surrounded with even more inspiration and experienced cyclists. This year is Frend’s third season as a senior rider. 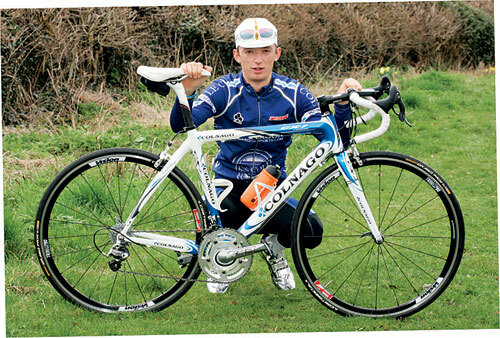 He was thrown in at the deep end in his first year, riding the UCI Tour of Taiwan with the KFS Special Vehicles team. This season has had a similarly demanding start, with Frend racing in the Tour of Libya in March. It’s a far cry from the usual racing he was doing most weeks as a junior, riding local races at Darley Moor and Mallory Park. “I want to make sure I make constant improvements and not tread water,” he says. Feeling fresh from his rides in Libya, Frend heads through Dunstall, and past the Dunstall Cricket Club, where his brother Matt plays. Towards Needwood, Frend negotiates the long, straight Roman roads that roll up and down in quick succession over a couple of miles stretch; rather like giant speed bumps. Most teams take a while to gel over the season, but the boys at Pendragon appear to have settled in well after being stuck with each other for a week in Libya. Frend tells me he’s not afraid to learn the ropes and stresses the importance of having people around you that can better you as a bike rider. We’re heading towards Uttoxeter, the only real major town on the quiet route. Not long after Frend negotiates the Uttoxeter’s roundabouts, we’re in Rocester, home to the headquarters of JCB Earthmovers. It’s a small town taken over by yellow diggers, heavy goods vehicles, and a rather obviously parked helicopter by the landscaped lake in front of the main buildings. “This stretch between Uttoxeter and Alton is great for doing intervals, because there’s so much variability in the UK races I need to work on that as part of my riding too,” says Frend. For some reason, we don’t seem as excited as most people who travel along this road on the way to Alton Towers. It’s somewhere I’ve always wanted to go, but have never quite got around to it. “I’ve been; it’s not quite as tough as some of the cycling over there. But it was good, we’ll have to get some of the UK peloton around for a trip there,” Frend jests. This has been Frend’s preferred training loop for a good few years now. As he passes through the climbs of Alton week on week, he’s had a chance to gauge his form and think about what the season has in store of him. “My goals really work month by month, I wouldn’t want to put any objectives out there because I think my targets can change purely by how I progress, as I’m moving forward all of the time,” he says, keen not to give too much away. “It’s just onwards and upwards really,” he adds. Frend is now going onwards and upwards through Alton, as he negotiates one of the longer climbs towards the main gate of Alton Towers. Sadly, as we pass the theme park sign, Frend simply pushes on the pedals further to continue his training loop. It’s down through some narrow country lanes towards the A50, coming out west of Uttoxeter. From there, Frend heads past Bramshall and along towards Abbots Bromley. This small village is the sign that he’s nearly home, it’s not many miles away from Needwood, where he picks up the loop and heads back towards his local village. “I like that loop, whatever Premier Calendars are coming up you know you can prepare on similar roads around here, just by heading in a different direction, it helps mentally,” concludes Frend, after putting in another good day at the office. From Barton-under-Needwood, head north through Dunstall and towards Needwood. Continue on the B5017, cross over at Draycott In The Clay and continue on the road to Uttoxeter. Go through Uttoxeter on the B5030, past JCB and bear left on the B5031 into Alton. Pass Alton Towers on the B5032, turn left down minor road before Cheadle. Follow road to Lower Tean, cross A522 and A50 and head on Leigh Lane to Bramshall. Keep south and cross the A518 onto Holly Lane, then B5013 to Abbots Bromley. At the end of the village, turn left onto B5234, cross main A515 road into Needwood and follow route to Barton-under-Needwood. Frend might be a little coy about this season’s targets, but is a little more talkative when it comes to the long-term. “Overall I’d like to be a full-time bike rider on the European circuit, riding as big a race as I can do,” he reveals. “I’ve taken a lot of inspiration from Daniel Lloyd, I’m sure he won’t mind me saying, but it’s taken him a few years to do it and until three or four years ago it looked like he was struggling to make it. Now he’s finishing top 15 in some of the biggest races in the world. I’d like to think I have that kind of determination. “This year, if all of a sudden if I get a big result then my whole goal set will change to try and build on that.